Mayor Steve Hagerty talks about affordable housing at a special City Council meeting on Monday. Aldermen at the meeting discussed the impact of rent regulations on affordable housing opportunities for students and residents. Aldermen and residents discussed several proposals involving the impact of rent regulation on increasing affordable housing opportunities in Evanston at a special City Council meeting Monday. At the meeting, aldermen reviewed recent discussions by the Inclusionary Housing Ordinance Subcommittee and analyzed proposals for motions involving rent and landlord regulations. Earlier in the month, the subcommittee considered the limitations of the ordinance and additional steps to address affordable housing issues. 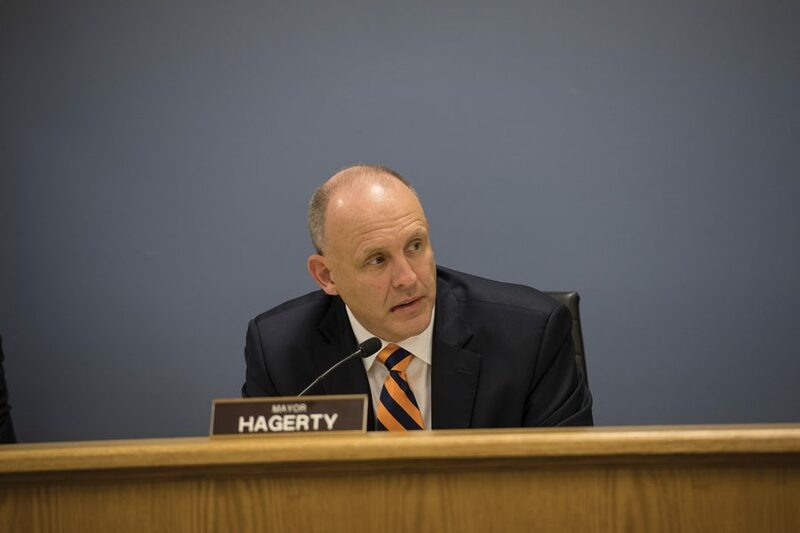 Mayor Steve Hagerty said discussion on affordable housing needs to include a thoughtfully strategic plan for the allocation of funds, something he said has been missing from past dialogue. Aldermen went on to discuss specific affordable housing issues, including a proposition to allow families to rent existing accessory housing units to unrelated individuals, in an effort to increase affordability and expand rental housing choices. Ultimately, after discussing rent control, aldermen voted to refer the issue to the Plan Commission. During public comment, Evanston residents talked about their experiences with homelessness and extortion, urging aldermen to continue working toward increased affordability. Among the residents were three Northwestern students representing Associated Student Government, who asked council to consider changing the occupancy limit from three to four unrelated people, hoping to provide more opportunities for students to find affordable off-campus housing. Communication sophomore Jillian Gilburne told a story about four NU students experiencing landlord extortion while living in off-campus housing. The students, she said, confirmed with the landlord before signing the lease that four occupants were allowed. A few months later, however, Gilburne said the landlord saw four names on the mailbox and alerted them that it was against city code. “He told them that he would be willing to look the other way if they could pay another $1,000 to their rent; otherwise, they would be evicted,” Gilburne said. Aldermen agreed that this was a problem but were divided on the solution. Ald. Ann Rainey (8th) said she was strongly in favor of getting rid of the ordinance, noting that there is no reason four people shouldn’t be allowed to live in a two-bedroom apartment. Ald. Judy Fiske (1st), who defended the ordinance, said she wants to concentrate on increasing the number of rooming house licenses given out in the 1st ward. Housing policy and planning analyst Savannah Clement said existing rooming houses include NU dorms, fraternity and sorority houses and single-family homes often rented to students living off campus. Fiske told The Daily that increasing the number of rooming houses would provide more opportunities for students to live in big groups, while also preventing situations where students are forced to hide their occupancy numbers for fear of eviction or extortion. Aldermen will revisit the issue on April 9 to allow time for a community meeting on the topic.